There are several types of commonly used methods for ELISA. From these methods, many other variations have been used depending on the biological question, available binder, and detection methodology. A direct ELISA is differentiated from other ELISA methods due to the fact the antigen is bound directly to the well of a microplate and the detection (or binding) antibody is directly conjugated, as opposed to use of a secondary conjugated antibody as in indirect ELISAs. Briefly, following antigen coating and immobilization to the microplate surface, a blocking agent is added to prevent nonspecific binding by detection antibody. Next, a detection antibody directly conjugated to an enzyme (eg, HRP) is delivered to the well, followed by addition of a substrate for the enzyme. After short incubation and addition of stop solution, the signal is measured on a plate reader. Direct ELISA assays have the overall easiest set-up. 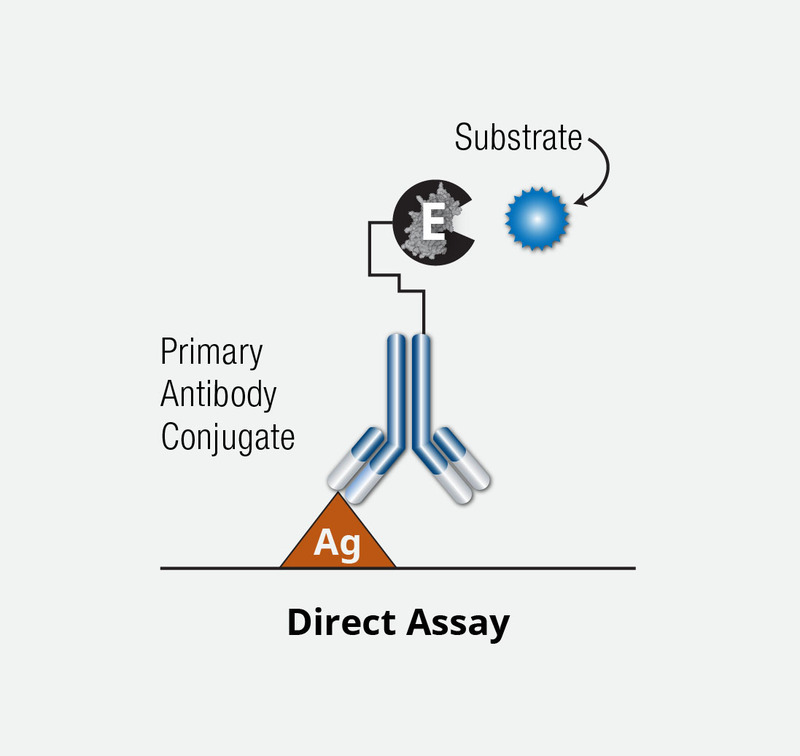 While similar to a direct ELISA, the indirect ELISA detects the binding antibody using a second, conjugated antibody. In general, the first few steps of a direct ELISA are followed, including immobilization and blocking. 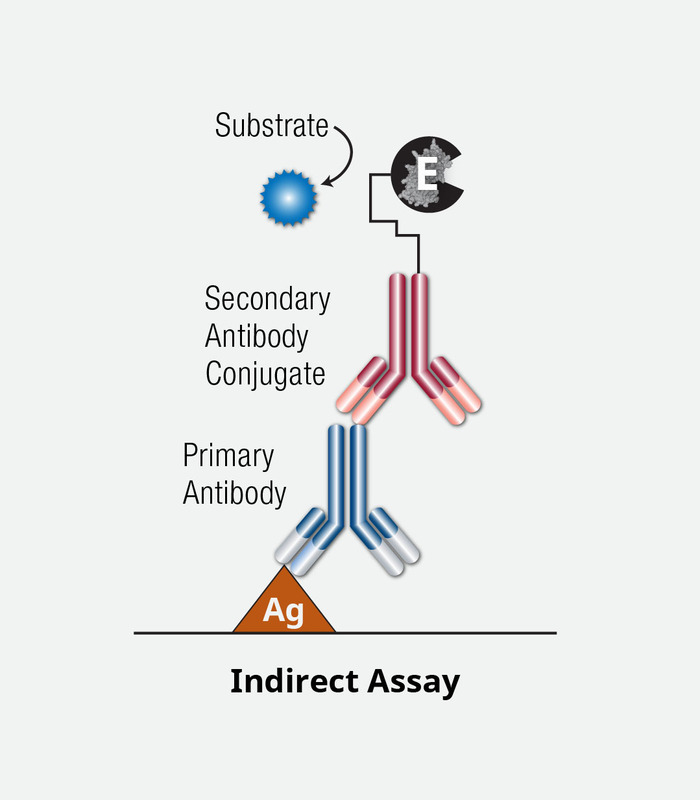 A detection antibody is added but, unlike the direct ELISA, this antibody is not conjugated. A second antibody (conjugated to an enzyme) is then added to detect this first binding antibody. Another washing step precedes the addition of a substrate and stop solution. The signal is then detected using a plate reader. The use of a secondary or secondary/tertiary antibodies for detection can lead to signal amplification but also leads to a longer, more time-consuming, and more complex procedure. Briefly, after washing and blocking the immobilized capture antibody, sample containing antigen is added to the microplate. A detection antibody is added that will bind to another region of the sample molecule. This antibody may be directly conjugated to an enzyme. If it is not conjugated, a second antibody (conjugated to an enzyme) is used to detect this first binding antibody. After washing the well, substrate for the enzyme is added, followed by a short incubation and addition of the stop solution. The signal from each well would typically be measured on a plate reader. At CST, we offer several types of sandwich assay kits, including PathScan® a traditional solid-phase ELISA format, and FastScan™, a solution-based ELISA assays format. While each technology is in a sandwich-based assay format, the latter generates faster results with less steps and reduced washing. This is a result of generating a sandwich complex, composed of the antibody and analyte, in solution, then immobilizing with an affinity tag onto the plate. Learn more about which format is better for you. A competitive ELISA, also known as an inhibition or blocking ELISA, measures the amount of analyte in a sample by quantification of its interference with an expected signal. 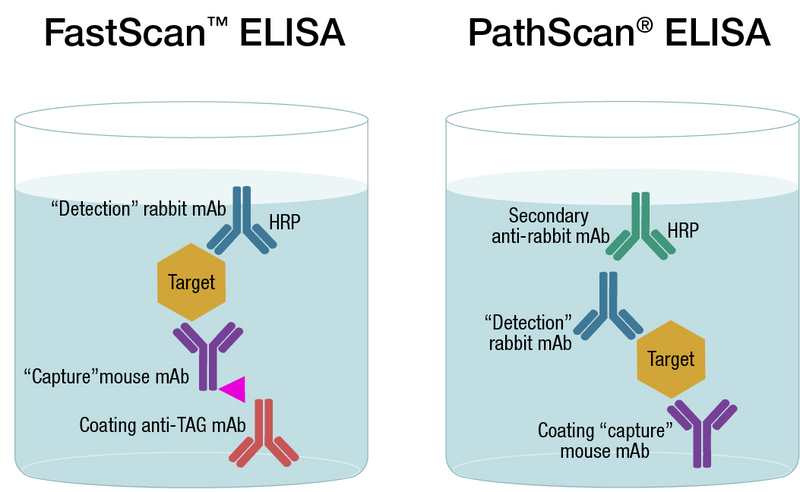 Competitive ELISAs can be performed in two ways: the microplate can be coated with an analyte or with an antibody specific for the target analyte. A target analyte that has a detection moiety (eg, a conjugated fluorescent dye) can be added, competing for binding sites on the antibody. A low amount of binding would indicate a high level of target analyte in the sample. The signal inversely correlates with the amount of analyte such that, if the concentration of the target analyte is high, then the reference signal is diminished through its competitive binding to a limited amount of labeled antibody. A multiplex ELISA enables a researcher to assess the levels of more than one protein target at a time, and it is typically used to determine the expression of multiple cytokines simultaneously. Unlike traditional ELISA formats, multiplex ELISA methods utilizes one or more of the following techniques: flow cytometry, fluorescence, chemiluminescence, or electrochemiluminescence. Flow cytometric analysis is the most commonly employed multiplex ELISA method and is performed using bead-conjugated antibodies. Typically, a greater number of cytokines can be measured at a time by using flow cytometry and bead-conjugated antibodies, compared to other methods.